Agapаnthus - plant, care, and cultivation. Agapаnthus - varieties, species. Agapanthus is a sort of perennial plants now belonging to own family of Agapanthaceae. However, before representatives of this sort carried at first to the family of Liliaceae, then moved to the family of Amaryllidaceae, and after – to the family of Alliaceae. Dissociation of opinions, probably, also led to that for this sort allocated separate family. Agapanthus came from South Africa, there in a wild look he lives mainly in mountains. The name of this plant came from a combination of words of Greek which is translated as "a love flower". 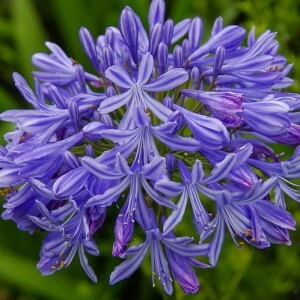 About Agapanthus there is a beautiful legend which tells about the Abyssinian beauty Agapa who was lost from hands of tribes people because of adoption of Christianity by it. In that place where the girl was lost, and the delightful flower grew. In Africa this plant is considered a symbol of good luck and abundance.